Edgar and Raine Sorrells-Adewale who have been married for decades came by to picked up their new rings. Many of the people who come by our shop are replacing older wedding rings and renewing their vows. Raine and Edgar retired in Santa Fe and we made new rings for them. Jewelry is so richly symbolic that often we have extraordinary moments of humanity and grace in our store that brings our customers and us to tears. Jewelry may also be just simply celebratory. Sometimes people come to gift themselves or to mark an occasion for someone special—a niece about to graduate or a first communion gift. We love doing the work we do and always feel privileged and honored to make these pieces that mark life’s beautiful and challenging transitional moments. 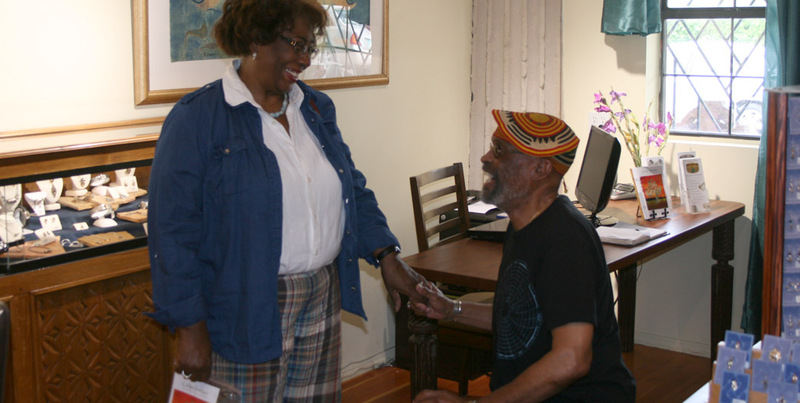 Last week Edgar and Raine Sorrells-Adewale who have been married for decades came by to picked up their new rings. You can imagine the beautiful poetry that flowed from Edgar by looking at his beloved Raine’s face in the photo. I still feel inspired by that moment of devotion and love echoing like in my heart even as I write this post. Thanks to Edgar and Raine for permission to post this photo to inspire others.